(Host) For years, the Canadian border town of Franklin has opened its Town Meeting with a prayer. But with that tradition at the center of a lawsuit, the town acted with caution this year. As VPR’s Melody Bodette reports. (Bodette) As the meeting opened, Moderator Timothy Magnant said he wanted to address the issue head on. (Magnant) "We usually start with a prayer. But that’s not going to happen this year, with respect to our honorable judge Martin Maley to make a decision on this in our Vermont Superior Court. We’re just not going to do it this year in hope that we can continue the process another year. I apologize for that. That’s what counsel has told me is the best move." (Bodette) Magnant says the people of Franklin are strong and he’d love to continue the prayer. But he asked voters to keep the meeting civil. The move came as a surprise to Marilyn Hackett, who was sitting alone in the third row of the school gymnasium. (Hackett) "I certainly liked being welcomed for a change, and I liked the call to civility. In the past, I’ve been personally named and shamed on the floor of this town meeting." (Bodette) Hackett, a para-educator in her 50’s, has asked the town for years to stop inviting a local pastor to offer a Christian prayer at the start of the meeting. After last year’s meeting, she sued the town, and the moderator to stop the practice. The Vermont Chapter of the ACLU has taken up the case. 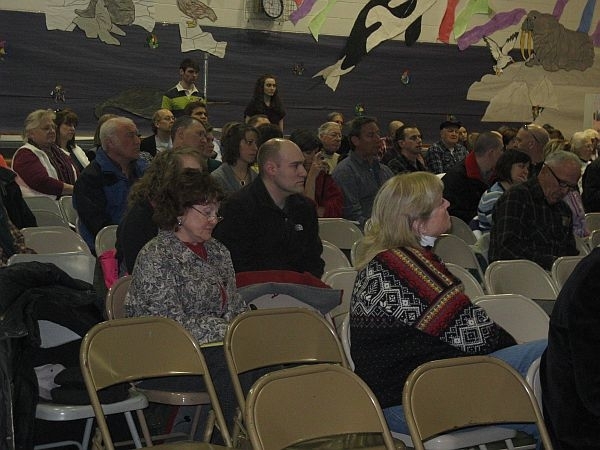 The town votes from the floor, so residents have to attend to be heard. So the ACLU says they’re being compelled to attend religious worship, which isn’t allowed under the state’s Constitution. A judge has still not ruled on the case. Still, Hackett was a bit taken aback by the decision. (Hackett) "It was very strange to have the moderator apologizing for not discriminating against people in Franklin who are not Christian." (Magnant)"All those in favor of Tim Magnant for moderator?" (Crowd ) "Aye." (Magnant) "All those opposed?" (Bodette) Despite being named in the lawsuit, Moderator Timothy Magnant was unanimously re-elected. Many in town support him – and also still want the prayer. Martha Olmstead served as town clerk for 30 years. She likes the prayer. (Martha Olmstead) "I think it’s too bad, I think they should have it. Legislature has it, why can’t we?" (Larry Myott) "I think that that person has to respect the values of the community and we can respect her values, but there’s certainly room for compromise, which she hasn’t been willing to do." (Bodette) Hackett has been an active participant in town meetings unrelated to the prayer over the years. The town has suggested she and others who didn’t want to hear it could leave the room during the prayer. Her lawyers say that’s no solution. (Hackett) "I will vote any chance I get. I think our form of government is as good as it gets pretty much." (Bodette) For VPR News, I’m Melody Bodette in Franklin. While a handful of towns in Vermont are considering creating a joint police force to cut costs, a similar arrangement in Franklin County has led to a legal challenge that’s headed to the state’s highest court.